We believe its not enough to be a musician, you have to be an entertainer, you have to be in shape, you have to be the total package. 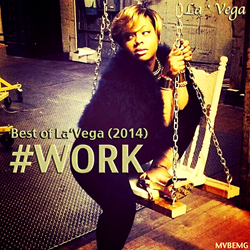 Rockland County, New York, based independent record label MVBEMG has their popular up-and-coming Hip Hop artist La ' Vega on a tight schedule. Every week she has studio sessions at Quad Studios, dance rehearsal with celebrity choreographer Jona Biddle, acting class in midtown Manhattan, and she works out at Soma Health & Spa, in Bronx, New York. The weekly studio sessions are necessary because of how frequently La ' Vega writes new songs. She makes music at such a feverish pace, she has amassed a hefty catalog of published, and unpublished music. So much music, her label has released a "Best of" compilation of her most popular songs, in 2014, on iTunes. The iTunes version of the mixtape features a bonus track, "They Ain't Like Me", and also a digital booklet of some of her pictures from her photo shoots with Hip Hop celebrity photographer, Felix Natal Jr. Her manager Abdel 'Sosa' Russell, says she might just be the hardest working, and most consistent indie Hip Hop artist on the east coast. His comments are backed up by La ' Vega's extensive catalog of music on iTunes, SoundCloud, and several other music sites. "Our label strongly believes in artist development. We believe its not enough to be a musician, you have to be an entertainer, you have to be in shape, you have to be the total package." La ' Vega is currently getting ready to shoot her third music video with popular New York City music director Taya Simmons, she's taking on a more active role in her community, and she's also attending school.